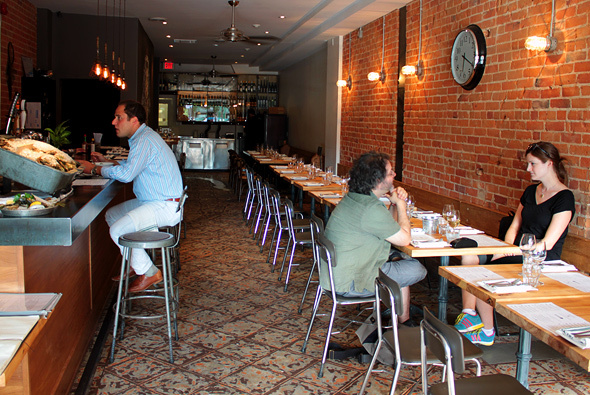 Fishbar has recently surfaced on bustling Lower Ossington near the corner of Dundas. William Tavares and partner Albino Silva of Salt Wine Bar have created a broad menu of tapas style seafood dishes that adhere to a sustainable practice that bears the Ocean Wise stamp of approval. Oh, and of course a well stocked oyster bar too. The bar itself boasts about five different types of oysters, both West and East Coast origins that rotate daily. 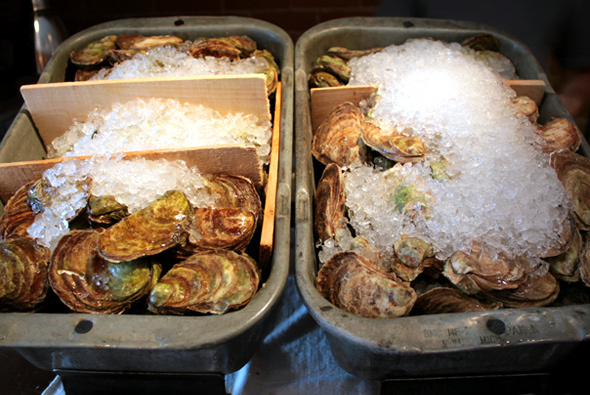 We decided to try the PEI Oyster, Uncle Willy ($2.50 each), simply served with fresh grated horseradish and lemon wedge. No shallot vingarette or heavy cocktail sauces were needed for this little sucker. The mineral and briny flavour was paired nicely with the reasonably priced Masicanco Pinot Grigio ($5). 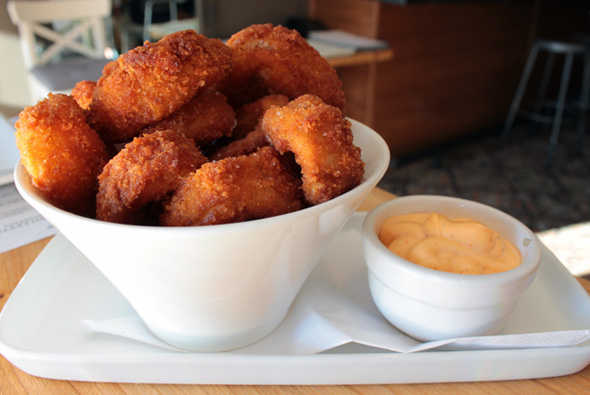 The Crispy Calamari with Srirachi aioli ($7) were unexpectedly tender and large. A shake up from the usually skimpy chewy squid that's shocked to life from a deep freeze with a plunge in boiling oil. 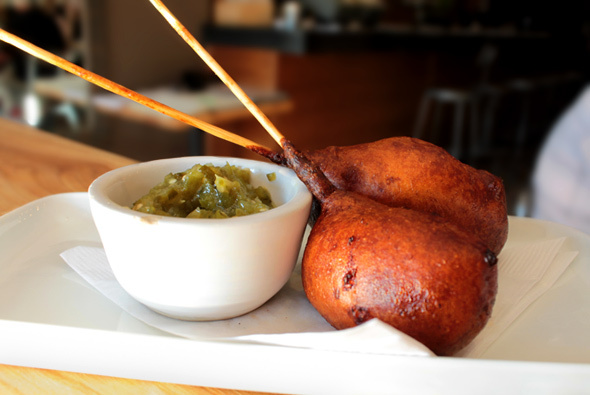 The oyster pogo with tomatillo relish ($8) was a playful take on a carnival corn dog; however issues with it's execution left less than stellar results. The batter absorbed too much of the oyster's brine creating a weepy undercooked center that was unsettling tepid. 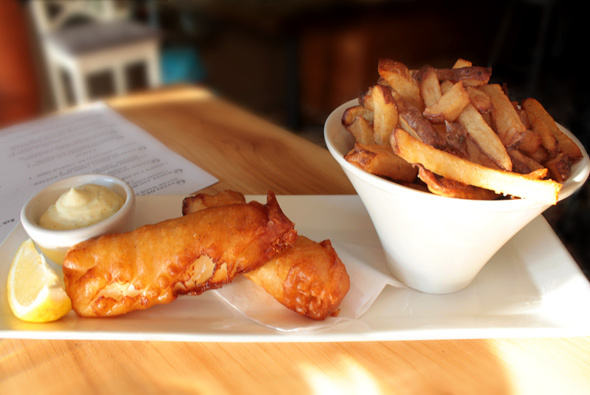 The line caught Haddock Fish & Chips ($11), with a St. Ambroise beer batter and homemade tartar sauce, was a step above the greasy batons of unidentified fish that are normally served at pubs. Tender and flaky, the fish crumbled in its hoppy shell. The PEI Mussels with chorizo and tomatoes ($8 - top photo) was the stand-out dish of the evening. The mussel's fume, coupled with the hearty chorizo, caused us to immediately sop up the rich both first before prying into the shells. 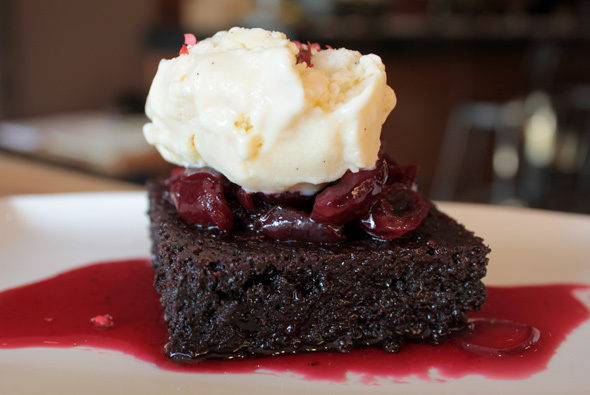 Although we were already full by this point, the chocolate brownie with cherry jam and vanilla ice cream ($8) was calling out to us from the trio of desserts being offered. The pink peppercorn dusting on the ice cream surprised us, adding a yin to the yang of the vanilla - a great combo. 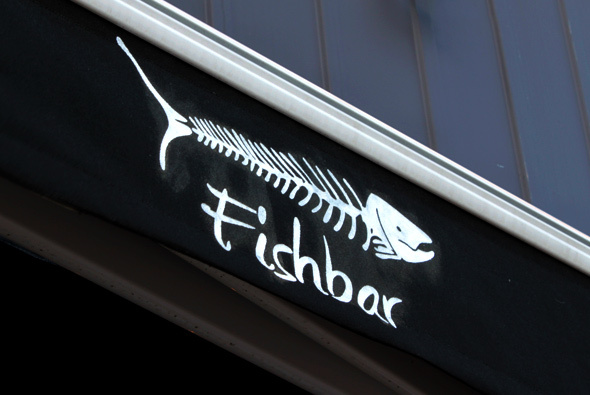 If not for their sustainable practices, Fishbar is worth a try for the high quality ingredients and solid fare.